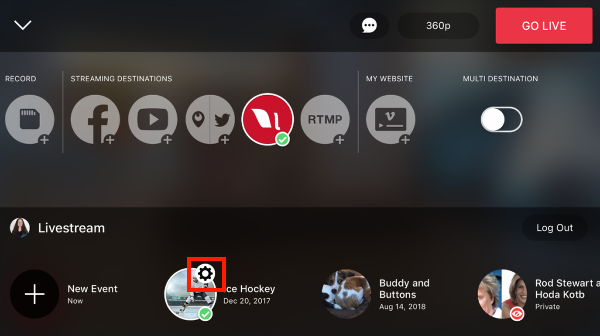 Livestream allows you to choose whether or not to send a notification to your subscribed followers on Livestream when you go live via Mevo. From the live production screen, tap the red button to access the live settings. Tap the Livestream icon and select your event. Upon doing so, a small gearwheel icon will appear next to its icon; tap the gearwheel to see further settings. The Notify Followers setting is here, toggled on by default. If you do not wish to send a notification to your Livestream followers that you are live, tap the switch to toggle this setting off. Tap Save when you're done.